Official Selection for the Rencontres d’Arles 2017 Discovery Award, on show 3 July to 24 September 2017 at the Atelier de la Mécanique, Arles, France. Exhibition curated by Elizabeth Breiner for nineteensixtyeight. All images by Guy Martin. Text by Reuters Turkey correspondent Ayla Jean Yackley for nineteensixtyeight. Amid the crackle of automatic gunfire and the blast of blacked-out fighter jets piercing the sonic barrier was another, distinctly human sound that signalled to Turks a military coup was underway on July 15, 2016. Throughout the long, terrifying night, imams in Turkey’s 85,000 mosques chanted the dirgeful sala, recited in the Ottoman Empire during wartime but heard only at funerals nowadays. For some, the disembodied azan resonated ominously as they huddled at home, fearful of bombs raining down. For a few thousand men and a handful of women, it was a call to arms to resist the dark forces of a military that had last intervened to seize power a generation ago. Their rush to the streets ensured that Turkey’s new social religious order would stay firmly in control. In an image from Guy Martin’s The Parallel State, the British photographer’s new collection of work on Turkey, a man dressed in street clothes, his back to the camera stands in a dusty room. Only the sarik on his head hints that he is the imam; without it, he could be a janitor in a broom closet. All the power flows through his microphone, with its capacity to stir people — especially when we’re offline in a country that throttles the internet when the government perceives a security threat. Martin’s work focuses on the duality of modern Turkish life: the seen and unseen, the interplay between fact and fiction. The truth rarely occurs in front of the camera, and Martin does not tear back the curtain obscuring the facts but lingers on the shadows dancing behind it. The result is disquieting but far more genuine than anything we can watch on TV or read in a Turkish newspaper. He recognises the value of photographing reality like a soap opera in a country where politics is theatre. In his work on Turkey’s wildly popular soap operas, he does not seek to capture actors in character, mid-scene, but documents them in their state of limbo before the director’s call for “action” or after he shouts “cut.” The same rules apply to his political and street photography. Martin does not break the fourth wall, but peers around it, treating it like a veil and not a barrier. He recognises the value of photographing reality like a soap opera in a country where politics is theatre. Narrative arcs that lead nowhere until they end in a character’s sudden demise. Mortal enemies who were once close consorts and previously unthinkable dangerous alliances. Dazzling opulence on display, paid for with shady sources of income. Are we watching a soap opera? Or is this the news? In Turkey, it can be hard to tell. During much of President Tayyip Erdoğan’s 13 years in power – first as prime minister, and, since 2014, as head of state – the country has lurched from crisis to crisis. Week in and week out ends with a cliff-hanger, and we tune in to see the latest saga. Even the coup was mistaken for a staged drama. The hashtag #darbedegiltiyatro (Not a coup, but theatre) trended on Twitter at the same time rogue troops commandeered F16s and tanks to kill 240 people, mostly civilians. An estimated 100 putschists also died in the night-long spasm of violence. The coup was the culmination of years of polarisation and pent-up anger on all sides of the political spectrum. For a brief period, the opposition rallied around the mercurial Erdoğan, 63, who escaped a commando raid to take him hostage (or worse). He was the only person strong enough to guide the battered nation, friends and foes seemed to agree. But the aftermath wrought more turmoil as a dominant Erdoğan, strengthened with emergency powers, began to take down his enemies en masse. Some 35,000 people have been jailed and 100,000 sacked from their jobs in the civil and security services. Companies worth tens of billions of dollars have been liquidated or seized. Leftists, Kurds and journalists have all been caught up in the dragnet, but the main targets of Erdoğan’s ire are the suspected followers of his former ally, the cleric Fethullah Gülen. The confusion itself is the story: to disrupt things that we know, to tell different, opposing stories in a deliberate attempt to confound people. Martin eschews the explicit violence that plagues day-to-day life in Turkey, hit by bombs, scarred by a Kurdish insurgency, reeling from the failed coup. Yet menace looms in many of his images: bullet holes, separatist graffiti, smashed up utility boxes. “How much violence can I reveal but not show it?” Martin asks. In the gritty Istanbul neighbourhood of Gaziosmanpaşa, a stronghold of the Alevi minority that Erdoğan has been unable to tame, Martin snapped a hand thrust into a birdcage wrapped in cling film. The tiny creature clutches the iron bar, resisting arrest against all odds. Even a photograph of a splendidly tiled mosque in Istanbul is foreboding: The prostrated men appear headless. They are Shi’ite, a tiny minority in overwhelming Sunni Turkey, and have seen their houses of worship targeted on occasion by arsonists. A former war photographer who suffered a near fatal attack in Libya in 2011, Martin came to Turkey the following year, still recovering from his wounds, in search of safety. “I wanted to operate in an environment where I could make mistakes, where I could just concentrate the mind on making pictures without having to go out and hide behind sandbags,” he says. Yet his work on the frontline was the kernel that led him to his project shooting Turkish soap operas. “In Libya, I saw the showboating of the rebels in front of TV cameras, and I was struck with the idea that I wasn’t actually taking the pictures that I felt were the most truthful, which were the staging of events,” he says. He spent the next six months hitching rides with Turkish TV crews, travelling to “the deepest corners of Istanbul” where filming took place. It was painstaking work; Martin could spend more than 20 hours on set and come back with a solitary image that worked. “It would be a terrible rate of return,” he says. But a new show was starting offset that drew Martin back into hard reality. In his fantastical City of Dreams, he paired his soap-opera stars with the even more glamorous real-life players in the 2013 Gezi Park protests. Normally buttoned-up Turks occupied the central Istanbul park to block Erdoğan’s plans to bulldoze the rare green space and build a shopping mall. The movement quickly morphed into a broader protest of his long reign and conservative policies and became the country’s largest anti-government demo in a generation. The burst of art, humour, romance and rebellion flourished for two heady weeks in June before police cracked down and cleared the area. In Turkish television and politics, memories and irony are in short supply. You have to look twice to figure out if Martin’s subjects are actors or activists. Was the beautiful blonde knocked to the ground by the blast of police teargas or the blow of a spurned lover? 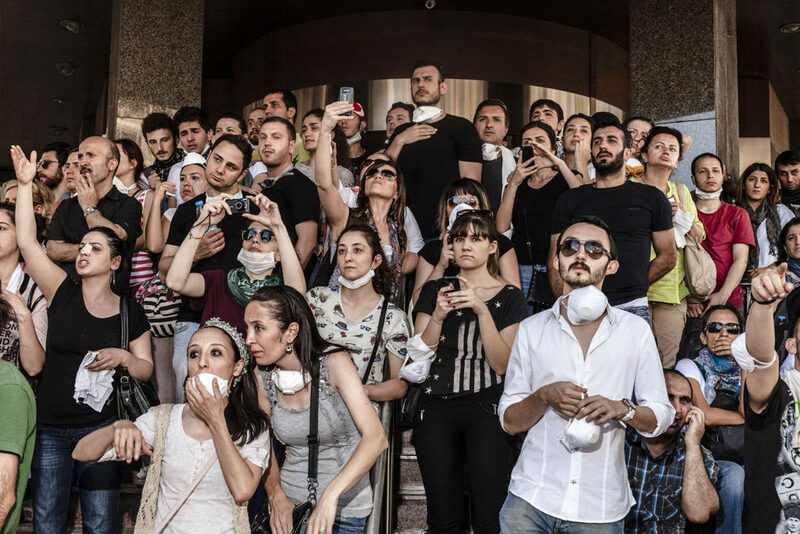 Could these bright-eyed, youthful stars actually be the “terrorists” Erdoğan labelled Gezi’s organisers in its wake? Since those days of chaos and beauty, Turkey has slouched towards bloodshed and authoritarianism. What felt like a watershed in Turkish social history now feels like a footnote to ensuing events far more ghastly. The ferocity of Gezi rattled Erdoğan, who became increasingly suspicious of foreign skulduggery and rivals at home. He warned time and again of coup plots until one inevitably unfolded. Martin shied away from conflict reporting, and during the bitterly contested Turkish election in June 2015, focused his lens on political reportage, including a leftist rally in the Kurdish regional capital of Diyarbakir. Then, bombs went off in the square, killing two and wounding 100 people. “It was a heart-shaking, ribcage-shaking noise,” he told me after the explosions as he described the bloodbath around him. War is hard to avoid in Turkey. Soon after the vote, a fragile ceasefire between the state and Kurdish militants reignited, sparking some of the deadliest violence in the three-decade insurgency. In the Kurdish city of Diyarbakir, blocks of ice melt on a hot pavement, an inexpert attempt to preserve the blood evidence of a girl who was shot dead while buying bread during a curfew in the mainly Kurdish southeast. In another, Martin captures the moment after a Kurdish woman chases a scorpion outside and kills it with her slipper. Scorpions are the name of armoured police vehicles that roam the streets outside of her Diyarbakir home. A police officer accompanied Martin into a house, partially razed during security operations in Diyarbakir’s ancient quarter of Sur. Upon the wall, partially destroyed by rocket fire, hung a portrait of Al Pacino in Scarface, recently embellished with a fresh bullet hole. Here again, far from the make-believe of Istanbul and Ankara, fact and fiction collided. The Syrian conflict rages at its border, transforming Turkey into the world’s largest host of refugees. Many fled as Islamic State took swathes of Syria along the Turkish border. But the jihadists were here too, among us, deploying their recruits to detonate themselves in crowds of peaceful protesters, a wedding party or tourists gathered near Islamic shrines. In an Istanbul suburb, Martin discovered a Banksy-esque Islamic State gift shop, hawking key chains, coffee mugs and the jihadists’ signature black flag. The resulting photographs are at once terrifying and banal. Martin holds up a fun-house mirror to Turkey and, with his flash, exposes the grotesque. “I’m beholden to events, and I am still working within documentary, but I am playing with the line in between. It can still be a documentary image, it doesn’t mean I have to put myself at risk or take that easily digestible bit of news,” he says. News crews filmed a gunman’s inept attempt to shoot one of Turkey’s best-known journalists, Can Dündar, outside a courthouse thronged with police. An hour later, judges sentenced him and his editor to more than five years in jail for purportedly exposing the government’s illicit weapons trade with Syria. Dündar’s paper, Cumhuriyet, has since been caught in the media clampdown that has squashed virtually all opposition voices. What is left are a handful of anonymous Twitter accounts, with silly names like the Pelican Brief, that proclaim themselves whistle blowers, then leak half-truths aimed at distorting reality further. Why bother with empty news broadcasts when television dramas offer delicious escapism? The soap operas that first drew Martin to their sets are a welcome diversion, their improbable plotlines help us settle in these strange times. From a rear window in the city, Martin peers into the living rooms of neighbours, capturing the red or yellow glow of the TV warming the curtains. Amid the fantasy and fear, he watches from beyond the screen as they seek out a parallel state of mind.